In 1947, Lucio Fontana (Italy, 1988-1968) launched the Movimento Spaziale in Italy. The movement was primarily concerned with the utilization of neon, radio, television to make innovative art, but Fontana’s investigation also led to a series of monochromatic canvases that he slashed with razor cuts. For Fontana, the cuts incorporated a new realism that went beyond the illusionism of traditional painting. This summer, 11R has mounted an intriguing group show about Fontana’s influence and legacy. 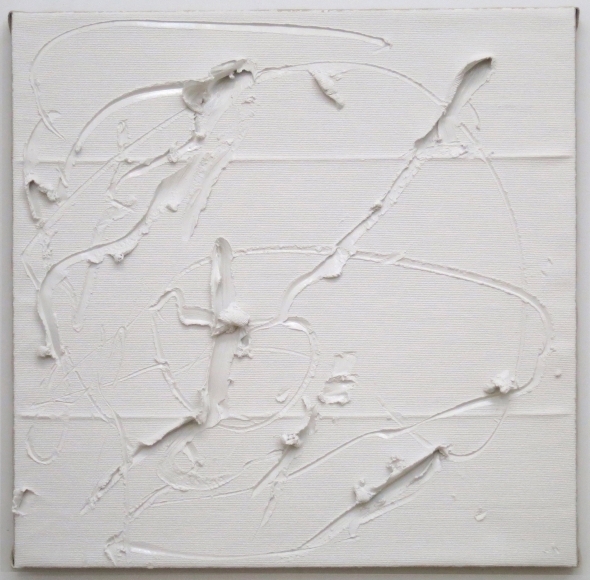 The exhibition includes one gray slash painting that Fontana made in 1960 alongside work by Amy Feldman, Maximilian Schubert, and Alan Wiener–younger artists who have each adopted an element of Fontana’s approach, from using monochromatic color to exploring simple hand-drawn gesture and treating paintings as objects. Maximilian Schubert, Untitled, 2016; cast acrylic polyurethane, fiberglass, acrylic and vinyl paints; 40 x 40 inches. Installation view at 11R, Maximilian Schubert, Alan Wiener. Maximilian Schubert’s forceful pieces at first appear to be gouged plaster slabs, but in fact they are made by crudely inscribing wax tablets and then casting them in polyurethane and fiberglass. Although Schubert finishes them with a bit of trompe l’oeil brushwork, the objects are essentially sculptures masquerading as paintings. Maximilian Schubert, Untitled, 2016, cast acrylic polyurethane, fiberglass, acrylic and vinyl paints, 30 x 30 inches. Amy Feldman, Doodle Doom, 2016, acrylic on canvas, 79 x 79 inches. In her new work, Amy Feldman continues her signature Fontana-like gray-on-white approach, but her range of forms has expanded and become more complex than previous work. In the painting above, Feldman’s familiar solo intestine shape becomes part of a larger compositional strategy that incorporates line as well as shape. Amy Feldman, Dark Double, 2016, acrylic on canvas, 79 x 95 inches. Alan Wiener, Untitled (8), 2015, aquaresin, stone, 5 x 10 x 3 inches. Alan Wiener makes abstract sculptures that, like Fontana (and Feldman), use a limited palette. Of all the work in the show, Wiener’s relates least to Fontana’s. Nevertheless, he combines materials–aquaresin, brick, slag, and stone–in evocative ways. Working at a small-scale, Wiener celebrates formal organization, but irregularities and accidents temper his formalist tendency, infusing the work with a poignant lyricism. Alan Wiener, Untitled, 2010, aquaresin, 20.25 x 7 x 6.75 inches. The show, though overcrowded and under-edited, gathers resonant, tactile pieces. Moreover, a monochromatic summer show based on Fontana’s gray painting is a wry choice–July shows are typically lousy with exuberant color–and I like it. It’s so … cool. The Amy Feldman painting you label as “Dark Double” is mis-labelled. The painting in your illustration is a different work by Feldman. The Amy Feldman painting your show in the 2nd illustion is titled: Civic Psychic, 2016, Acrylic on canvas, 79 x 79 inches.